What Hotel Trends Will Shape 2015? WASHINGTON, DC—For the majority of the hotel industry, 2015 is shaping up to be another outstanding year. With that in mind, it is incumbent upon hotel owners, operators and investors to be opportunistic: if 2015 turns out to be the excellent year we are predicting, it makes sense to take advantage of the ability to drive rate in most markets. The motivation to make the most out of the positive conditions predicted for 2015 manifests itself in different ways. There are some owners saying, essentially: “With the numbers looking great right now, let’s work on wrapping up our brand renewal and securing early financing with a bank.” Others, however, may believe that 2015 is the perfect time to sell. Selling at the peak of the market makes sense—even more so if that peak is followed by a significant decline. Even though near term projections are positive, seasoned hoteliers know that the industry is cyclical and it is only natural for some to start asking the question: how much longer is this going to last? The fact is the lodging market has experienced unprecedented demand growth in 2014 and factors that have historically been red flags to an impending downturn are not showing any near term effect. Overbuilding is always a concern but with supply increases of 1%-1.3% forecasted, this does not appear to be an imminent threat to the industry. However, there are some factors worth paying close attention to. One economic issue, which has been discussed exhaustively for some time now, is unease about the impact of the employee mandate. Uncertainties remain with this legislative development, and it is not clear yet if hotel owners and operators have a good handle on what the employee mandate will cost them. There is almost certain to be some kind of ripple effect from that, and corporate travel is typically first to go when belts need to be tightened. Then there is the uncontrollable – the threat that is always present is the potential for a cataclysmic event that has an immediate impact on room demand and our national economy – think 9/11. It is simply a risk of having a business. Everyone in the hotel industry loves talking about, or speculating about, Millennials. Without too broadly characterizing this age group as a whole, I would point to two notable observances about their behavior that could have an impact on our business. One, they seem to be signing up for, and participating in, rewards programs and other similar promotions at a high rate. This indicates a level of brand consciousness and brand loyalty significantly higher than some of the early research has previously suggested. Second, is the accelerating growth of mobile bookings. The reality is that every single major brand is reporting all time record high numbers of reservations being made via mobile devices. What is especially interesting about this is the fact that users searching for and making the reservation on their smartphones and tablets are not often booking rooms through third party vendors: they are typically making their reservations directly. My own conclusion is that this means that there is less shopping going on, and that the growing numbers of mobile bookings are being made by people who already know what hotel or brand they like. That could be a very good thing for some hotels, and a very troubling sign for those who are behind the mobile curve. There has been some industry discussion in recent years theorizing that full-service hotels may be on the decline. While that may potentially bear out in the future, we are unlikely to see much change, if at all, in 2015. We generally do not see dramatic shifts in asset type when times are good; lean times are when big changes typically occur. For many hotel properties, status quo is likely to be the 2015 mantra. 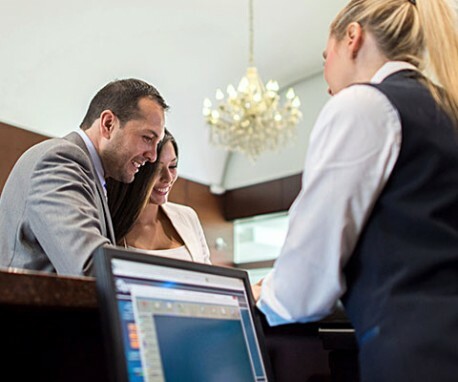 Professional hotel managers are always driven to find more efficient expense management and improved bottom lines. They know that top-line revenues can often hide a multitude of operational sins. It will not be until revenues start drying up that the inadequacies and lost opportunities become crystal clear to the disappointment of some owners. It is a good time to be in the hotel business but don’t be complacent, make sure your asset is realizing the benefits both on the top line and the bottom line.